Ginger Lane Holt grew up showing dogs, but raising pups to help the disabled was was not in her plans. Then she got sent to prison. 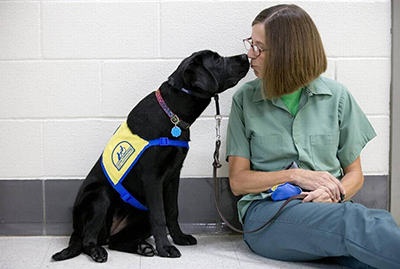 Holt is doing time at the Federal Medical Center Carswell, where she and three other inmates are part of a special program in which they help raise puppies for Canine Companions for Independence, a national nonprofit organization that trains service dogs. The 53-year-old Holt is serving an 8-year sentence for bank fraud and the time she spends with a black Labrador golden retriever pup gives her a much-needed sense of purpose. The federal prison is at Naval Air Station Fort Worth and houses more than 1,400 female inmates who have special medical and mental health needs. Carswell is one of 14 prisons throughout the country that the organization works with to raise puppies for service dog work, said Courtney Craig, public relations coordinator for the Canine Companions south central region. Since their partnership with Carswell started in 2009, Craig said 28 puppies have been raised there and seven have graduated as service dogs after they completed their formal training at Canine Companions, which has an Irving campus. The inmates — Holt, Crystal Arredondo, Terra Mercado and Kristen Simonson — are partners with the puppies, teaching them obedience and commands to help the disabled. The puppies, in turn, help the inmates cope with their prison life. “Inmates participating in the program often express appreciation for an experience in which they are able to contribute to the community in a positive way,” said Patricia Comstock, public information officer at Carswell. Mercado, who is serving a 10-year sentence for conspiracy to distribute methamphetamine, began raising puppies four years ago. She is currently raising Dominic. The work helps some of the inmates think about the future, too. Arredondo, 25, is also serving time for conspiracy to distribute meth, and said she wants to continue raising puppies once released. Arredondo is raising her first puppy, a female black Lab named Guide. She likes the special camaraderie that exists among the puppy raisers. “We work together as a team to raise these puppies so that they can become service dogs. That’s one aspect that I love about this program,” Arredondo said. Simonson was sentenced to almost six years for defrauding the government by filing a false tax claim. She’s raising her third puppy, Gully. She said when she gets out she wants to raise puppies with her children, who love seeing pictures of the dogs. In order to become primary puppy raisers, inmates have to apply and meet standards, including good behavior. The dogs come to the prison when they are 8 weeks old and stay for about a year and a half before they are returned to Canine Companions for their formal service dog training. The inmates teach the puppies obedience, leash walking and also make sure they are house-broken. They take the dogs on visits to the prison store, library and TV room. The four women also share a room, and the puppies sleep in crates next to their beds. 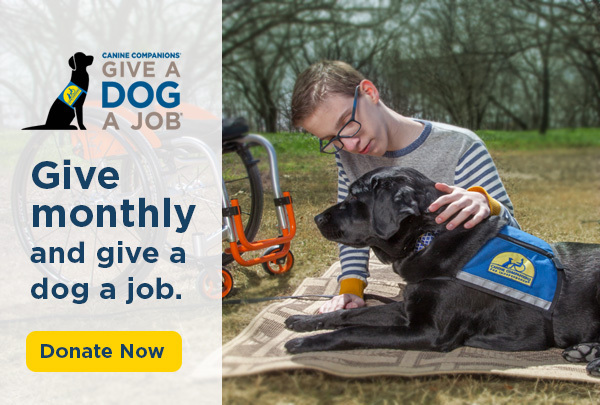 On weekends, volunteers come to the prison to take the puppies to shopping malls, sporting events and on business trips to expose them to places and situations they will encounter when they become service dogs. One woman who has benefited from the training of one of these dogs is Susan Mahoney. She has use of her hands but must have help with tasks such as taking clothes out of the washing machine or picking up dropped items. That is where her dog, Misha, comes in. Mahoney lives in Dallas and has twice visited the inmates at Carswell to show her appreciation. Mahoney said that at first, she was surprised to learn that inmates help with puppy raising. Dogs don’t judge, so why should we?